Mother's Day is celebrated on the second Sunday of May every year. This year Mother's Day date is May 14. Anna Marie Jarvis, seen as founder of Mother's Day, was the daughter of Ann Maria Reeves Jarvis, a social activist who organized events called Mothers' Day Work Clubs to reduce infant mortality. At the events doctors were invited to hold discussions with mothers on how to keep their children healthy and educate them with latest practices of hygiene and sanitation. Thomas Woodrow Wilson, the 28th President of the United States, on May 9, 1914, signed a proclamation following untiring efforts by Anna Marie Jarvis. 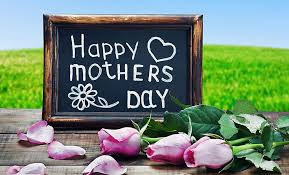 The United States, then declared the second Sunday of May a national holiday "as a public expression of our love and reverence for the mothers of our country". 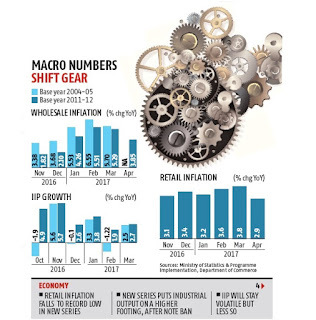 The new-look index of industrial production (IIP) and the wholesale price index (WPI), which were declared and have been built on the new series of data, paint a healthier picture of the Indian economy in 2016-17 than the old series did. The new series of the IIP shows higher growth rates in most months in the period April 2012 to March 2017 than was the case when the computation was done in accordance with the old series. This is attributable to the base shift, increase in the number of factories in the panel for the reporting data and excluding closed ones, and including new items and keeping out old ones. A massive ransomware attack, which security researchers say used a Windows exploit first developed by the United States National Security Agency, shut down computer systems across several countries, including India, last night. India was among the three countries worst affected by the attack, data shared by Kaspersky showed. However, there was no immediate information on what companies in India were affected in the cyberattack. News of the cyberattack initially made headlines after systems at hospitals across the United Kingdom were affected. Reuters reported that British hospitals and clinics were forced to turn away patients because their computers were infected by Wanna Cry. EternalBlue to infect computers running versions of Windows operating systems. EternalBlue was first made public last month after Shadow Brokers released a bunch of exploits and hacking tools developed by the US NSA. According to tech website Ars Techina, the NSA used EternalBlue to hack and remotely take over computers running Windows.new series has shifted to 2011-12, against the earlier 2004-05. Interestingly, Microsoft released a patch for the EternalBlue exploit just a few weeks before Shadow Brokers made the NSA-developed vulnerability's existence public. 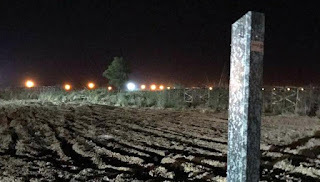 The Border Security Force (BSF) is all set to get more teeth to man the 198 km India-Pakistan international border using a newly developed technology that can detect intrusions and relay information immediately to the nearest post for action.